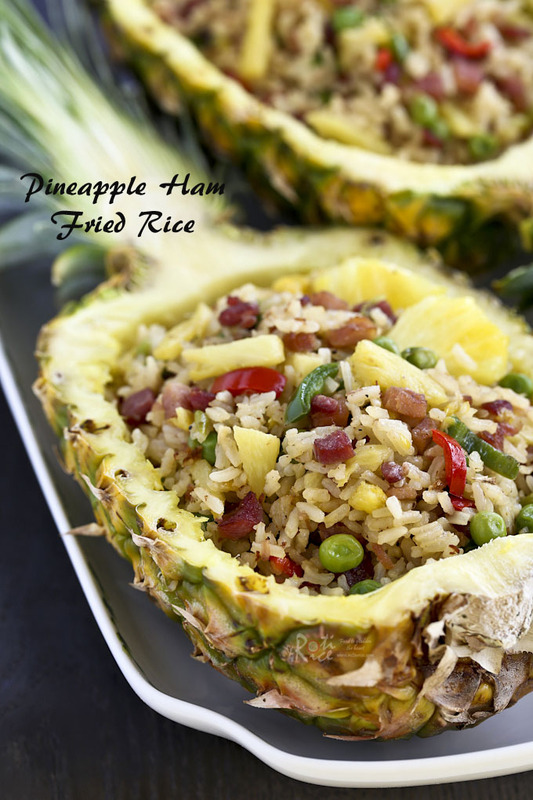 Pineapple Ham Fried Rice with a combination of sweet, salty, and fruity flavors that is sure to please. Serve it in a pineapple boat to wow and impress! It’s pineapple season! You can’t walk into a grocery store without seeing these tropical fruits in the center aisle. So many to choose from and they are on sale too. Pineapples are at their best at this time of the year – super sweet and juicy. This is my second pineapple for the season. The first one was used to make these quick and easy Chicken Pineapple Sausage Kabobs which turned out to be delicious. The caramelized pineapples were great and I was hooked. I had to get another pineapple. We ate half of the second pineapple and I saved the other half for this Pineapple Ham Fried Rice. I used some leftover Baked Ham from Easter together with green peas and chili peppers to give the fried rice just a little heat. Love the sweet, salty, and fruity combination of the fried rice. It was yummy! When it comes to pineapple fried rice, nothing beats serving it in a pineapple boat. It just makes it that much more appealing. I will show you how to carve the flesh out in the video. It really is quite simple, so do not be intimidated. I promise it is totally worth the effort. 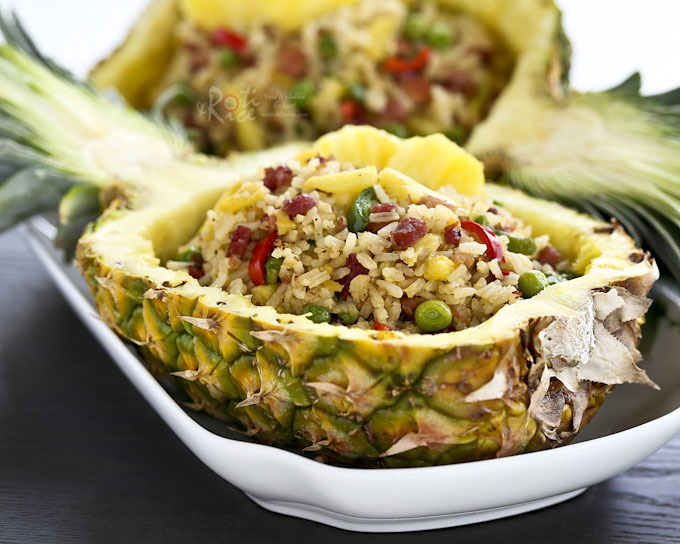 If you are planning to use pineapple boat as container for fried rice, cut pineapple in half lengthwise. Carefully cut around the perimeter of the halved pineapple. Then cut down the middle lengthwise followed by several more cuts widthwise. Scoop out flesh with a spoon. Reserve 1 cup (180g) pineapple for the fried rice. Squeeze out as much juice as possible. Set aside. In a wok or large fry pan, heat vegetable oil. Fry ham for 3 to 4 minutes until lightly brown. Add red and jalapeno pepper and garlic. Fry for 1 to 2 minutes. Then add pineapple and frozen green peas. Continue to fry for another 3 to 4 minutes. Add rice, pepper, and soy sauce. Stir to get everything well mixed. Cook for another 4 to 5 minutes or until rice is dry and fluffy. Turn off heat and transfer to pineapple boat or serving dish. Great looking recipe. Makes me think of some place like Hawaii!!! Yum! This looks absolutely delicious. Why dirty a plate when you can hollow out a pineapple? Love that idea!